The 310 Surface Plate Base Mount is a precision cast iron flat surface (Blanchard ground) ideal for layout work and as a portable work station. 10" x 10" (254mm x 254mm) square and weighing 10lbs. (4.5kg). Included are four non-marring, anti-skid neoprene base pads. 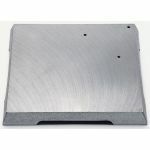 The top surface is drilled and tapped in one corner for the 300 Standard Base or 305 Low-Profile Base. Three 1/4 -20 screws for mounting Bases are included.